Converting website visitors into customers — as we all know — is not simple. It’s often a lengthy process, which requires constant persuasion of prospective customers (or leads). This process is referred to as Lead Nurturing, which starts with collecting leads. And, the more the number of leads, the higher is the chance of converting more customers! So how do you increase the number of leads? A lead magnet, as the name suggests, helps you attract leads. Lead magnets can be critical in a successful lead generation strategy, and this post will help you deploy them the right way. We’ve covered nine tips which you can use to build super-effective lead magnets. But first, let’s start with an introduction to lead magnets. A lead magnet is something valuable that you provide to your visitors in exchange of their contact details (usually, their email address) on a lead-gen form. A lead magnet can be anything: ebooks, whitepapers, research reports, eCommerce coupons, free access to an application, etc. If a lead magnet offers significant value, visitors fill in their contact information to receive that value. 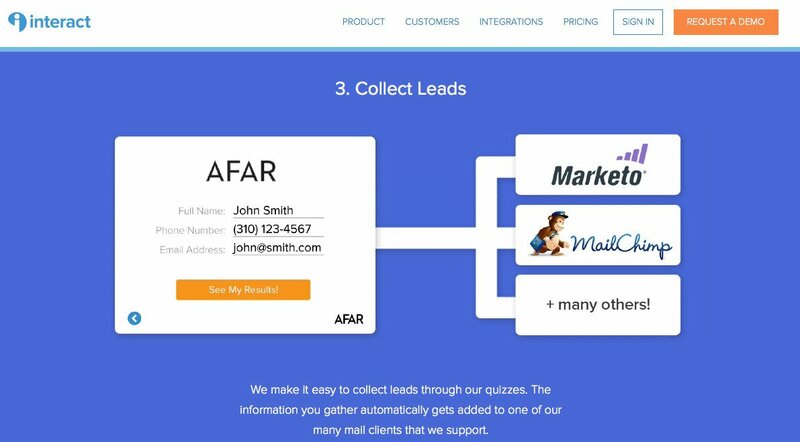 Users pay for your lead magnets with their contact information. Here is an example from Hubspot. 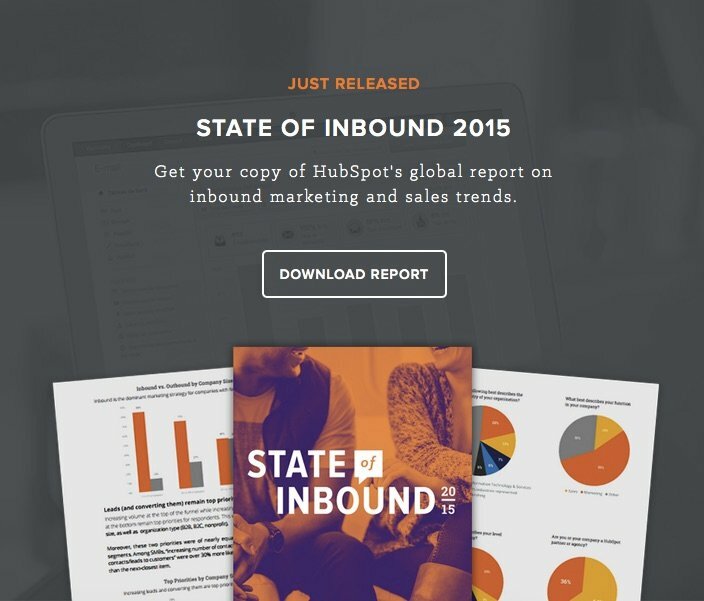 Hubspot is currently offering a report on the “State of Inbound Marketing and Sales Trends of 2015” on its homepage. On the face of it, the report seems to provide valuable insights to marketers. Marketers can take advantage of the report while planning their strategy for 2016. However, the report isn’t available for free. The “download report” button on the homepage is followed by this form. Only when I fill in the required details and submit the form, can I get my hands on the report. Considering the potential value of the report (and the credibility of the brand offering it), I find it a decent deal and complete the form. This is roughly how every lead magnet works. Now that we’re familiar with lead magnets, let’s take a look at ways to ensure their effectiveness. Use the following tips to build and optimize your lead magnets. A lead magnet has to be extremely targeted to work. If you’re offering a generic freebie on your form, you might end up collecting leads that are irrelevant to your business. Consider this: If you are a men’s beard grooming brand, releasing a guide on ‘How to Make Your Beard Trend on Pinterest’ is not very likely to get you great leads because 80% of audience on Pinterest are female. Targeting is essential in making your lead magnets work. Unbounce helps users create and optimize landing pages. Considering that, the lead magnet in the above form (“Guide to Landing Page Copywriting”) is highly targeted to its potential customers. While plain lead-gen forms can’t tell you how serious your leads are, form with lead magnets can. Your lead magnets can attract exactly the kind of leads that you desire, with content catering to prospects from specific conversion funnel stages. For instance,, you can employ BOFU content to capture users that have a high probability of getting converted into customers. BOFU lead magnets are normally entertained by users that have closely evaluated your product/service, but still haven’t made a decision to purchase it. BOFU content (or lead magnet) is a resource aligned closely with your company’s product or service. It can be a whitepaper talking about the functionality of your product/service, or simply a free-trial access to your product. Here is an example from our own website. The below form offers a Smart Stats ebook to the users who complete the form. Smart Stats is VWO’s new Bayesian based statistics engine. Users who sign up for the Smart Stats ebook want to learn closely about how VWO works. They can be safely assumed to be high quality leads, and can be nurtured accordingly. So how do you ensure that readers know the same for your regular lead magnets, too? 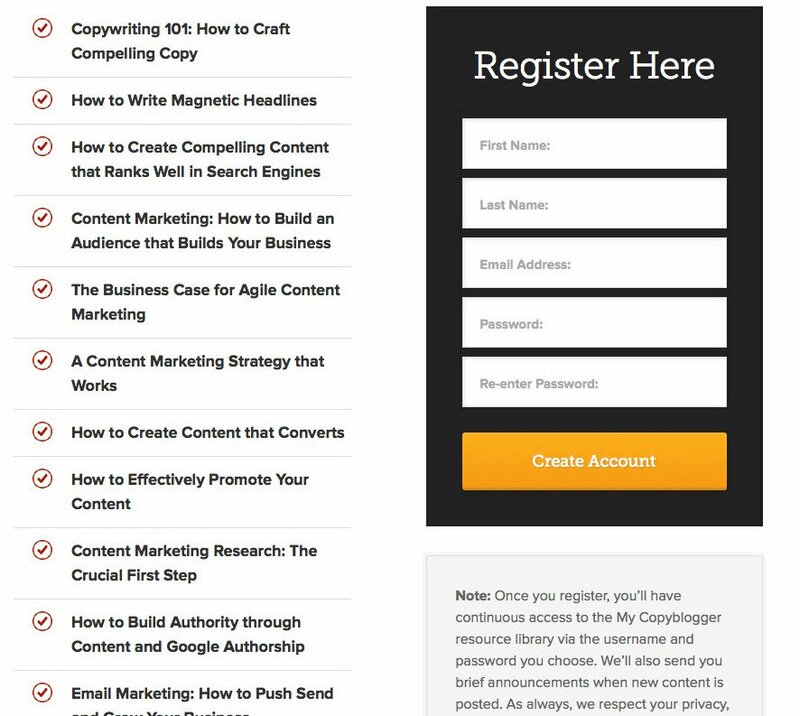 Tease your users into signing up for your lead magnets. On your lead-gen form or click-through page, highlight points about how the lead magnet can provide tremendous value to readers. You can list out the broad headlines and a few actionable insights that your lead magnet covers. 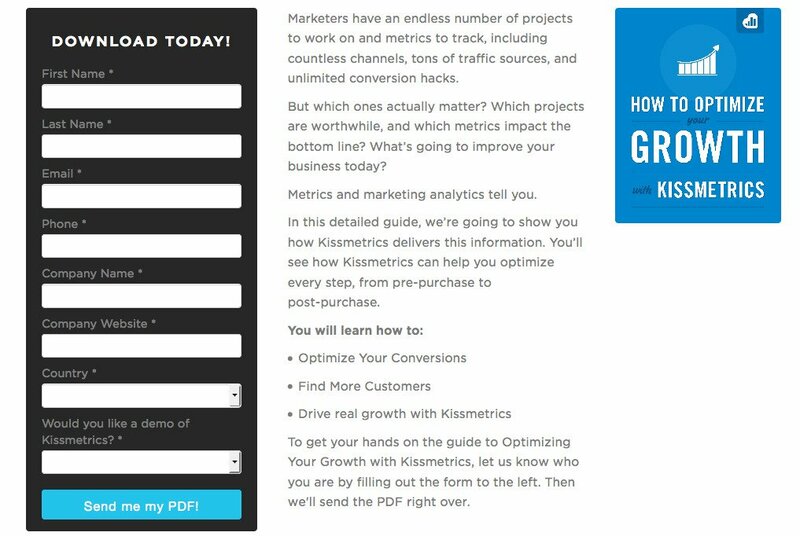 Take a look at this form-page by Kissmetrics. The lead magnet, here, is an ebook that is very specific to Kissmetrics potential customers. Noticeably, the form contains a lot of fields to be submitted by visitors. However, with an elaborate description of the ebook, the page gives a glimpse of its content. The page also lists out the benefits that the visitors can reap with the ebook. This helps nudge unsure visitors towards making an effort to download the resource. It is important to note that including the business value of a lead magnet on the form is essential. Make it clear how the lead magnet will help visitors improve their business objectives. Take cues from “Optimize Your Conversions,” “Find More Customers” and “Drive Real Growth” from the above form. Want to get started with your own lead magnet in as minimum time as possible? Go through your content library and identify that one content resource which performed the best. It can be anything: the most downloaded ebook, most viewed/shared blog post or case study, most viewed/shared Slideshare presentation deck, webinar with the highest number of attendees, etc. Content resources like ebooks, webinars, and slide decks can be readily used a lead magnet. If your best performer is one of these, start designing your form. Your star content can be your best bet as a lead magnet. Repurpose your blog post or case study into an ebook or a checklist or a cheat sheet. Now, employ them as your lead magnet. In-content lead magnets are the ones which are placed within an existing content resource. Mostly used within blog posts, they can also be placed within ebooks, presentation decks, etc. Content upgrades are in-content lead magnets, that are a downloadable version of the content they’re placed in. Content upgrades often provide greater conversions, because they are more contextual. Here is the logic: Since readers are spending time in reading through the content, they are (probably) finding it useful. This is a good time to offer the same content resource to the readers in a snackable form, which they can download and refer to anytime in the future. For instance, we used a content upgrade in one of our recent blog posts. 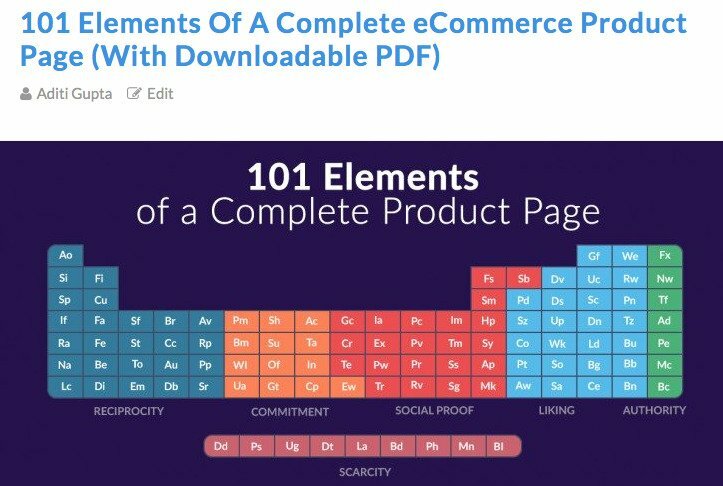 The post offers a comprehensive list of 101 elements that make up an effective eCommerce product page. 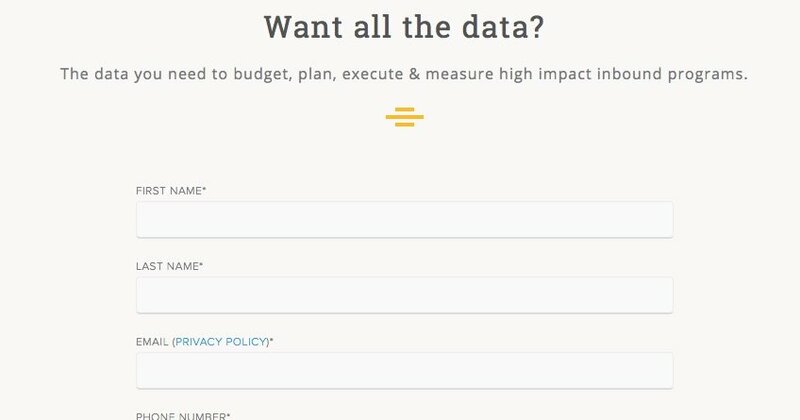 This is an excellent resource for marketers and web developers to find out what their product pages lack. Since it’s a rather long list, we thought that a PDF version would be useful for readers for future reference. Here is how we offer the PDF file within the post itself. Upon clicking, the button opens up a short form through which readers can download the file. Needless to say, this lead magnet has provided us with valuable leads — leads who would have otherwise read the post and moved on. This same technique has helped Backlinko’s Brian Dean increase his conversion rate from 0.54%. to 4.82%. Sure, ebooks are a handy resource to give away. But what if your website visitors crave for something other than ebooks? What if other forms of resources relate to your business and potential customers better? Some innovative types of lead magnets are actually worth taking a shot at. Jarrod Drysdale, the man behind Studio Fellow, Bootstrapping Design, and Cascade, uses a unique and intriguing design-course to capture leads. He offers the course on The Tiny Designer website to both designers and non-designers. And, this is where he captures his leads. You can even have quizzes as a measure of collecting leads. Interact Quiz Maker is one website that helps you do just that. When many of your competitors are offering free resources to their visitors, you need to step your game up. Tempt your visitors with not just one free resource, but a package of multiple resources. If one free resource can deliver significant value to the visitors, a package of resources can be invaluable! Raise the stakes on your lead magnets with a whole package of content. This is how Copyblogger executes it extremely effectively. Copyblogger offers a package of immensely valuable content resources to its visitors, in exchange of their email address. The form exhibits the list of ebooks that is included in the offer. 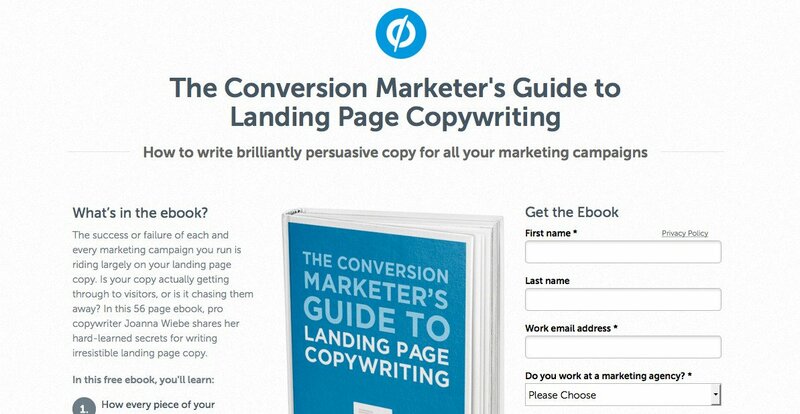 Using this, Copyblogger has been successful in increasing its email signups by almost 400%. A/B testing is essential in determining whether a lead magnet is working for you or not. Even when a lead magnet is driving a significant number of leads to you, you cannot be sure if that is the best you can achieve. A/B test in-content lead magnets with a sidebar lead magnet or a pop-up lead magnet. Test to see if a glimpse (gist) of lead magnet on a form helps you increase conversions in comparison to a form with just an image of the lead magnet. Find out what is driving the conversions (the offering or the form design). Test to find if a package of content works as a better lead magnet than a standalone content resource. Test different kinds of lead magnets given in the extensive list under point number six. Apart from these ideas, you can also test the design, placement, and usability of your lead magnet forms. You can also go through our archive of more than 150 case studies to find inspiration for your test hypotheses. Last but not the least, your lead magnet has to be greatly useful to your visitors. If your visitors don’t find any value in the lead magnet, they won’t develop a positive image of your brand. When your brand image suffers, so does your business. Even if a half-cooked lead magnet ends up delivering you a thousands leads, most leads might not convert at the end. Don’t offer obsolete content resources. Deliver the exact resource (in shape and content) which you promise on your lead-gen form. Offer content that is relevant to your typical website visitor. Make your content resources easily understandable. So What’s Your Lead Magnet Going To Be? Implement these ideas to build lead magnets on your website, and don’t forget to A/B test them. Let us know if your conversion rate gets a big boost.